The metal bullet housings use the same speaker technology and sound signature used in professional monitors. Noise-isolating in ear design sits the earpiece inside your ear canal to create a seal to the outside world that effectively cuts out external noise. Available in 4 different colours to suit your mood, blue, black, pink and white. Why not get a set of each? 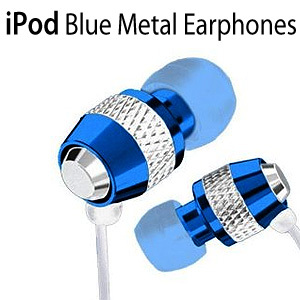 COMPATIBILITY: all iPhone, iPod, MP3, DVD, computer, and portable CD players. These are the perfect the earphones that I've been looking for, they block out all surrounding noise so you can hear your music clearly and not have to have it very loud, also they fit in my ears perfectly so i don't have to keep moving them to keep them in my ears. If your looking for a cheap pair of earphones that produce good quality sound then these earphones are a must buy and they are very cheap, normally i would find this type of quality sounding earphones would come from someone like Sony who charge triple the price.